OK, this has got to be just about the best student assignment I have ever heard of. 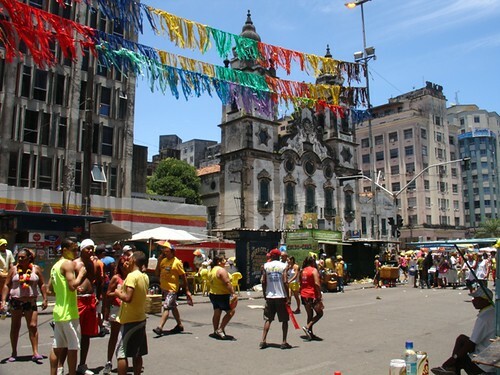 Thirteen students from the University of Cincinnati’s College of Design, Art, Architecture and Planning have recently spent months – on location, mind you – helping the city of Recife, Brazil get ready for the 2014 World Cup. According to the project’s web site, the students have been planning the redevelopment of a district surrounding the Av. 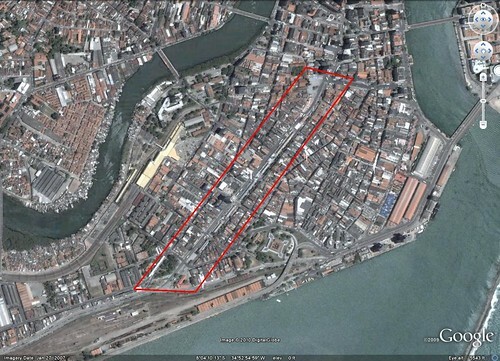 Dantas Barreto, a key market street in the center of the city of Recife (see outlined area above and highlighted area below). 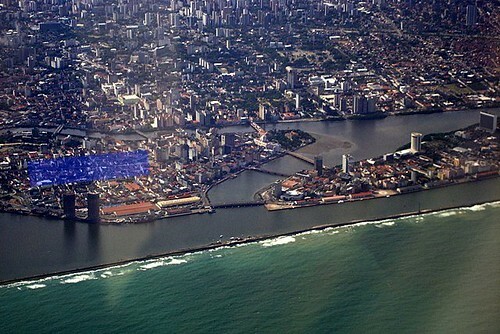 Located on the country’s east coast, Recife anchors the fourth largest metropolitan area in Brazil, with a regional population of just under four million residents. 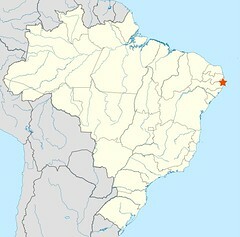 The city’s Wikipedia entry indicates that, in addition to being an industrial, technological, educational, and medical center, Recife is “home to the frevo, a regional dance and music, typical in carnival, and mangue beat, a type of Brazilian rock with mixture of maracatu, ciranda, rap and other musical styles. During carnival, downtown Recife holds one of the most authentic and democratic celebrations: every year more than one and a half million people open the festivities of the Brazilian Carnival at Galo da Madrugada.” You can see part of the festivities at the top of the post, on the avenue that is the focus of the students’ efforts. 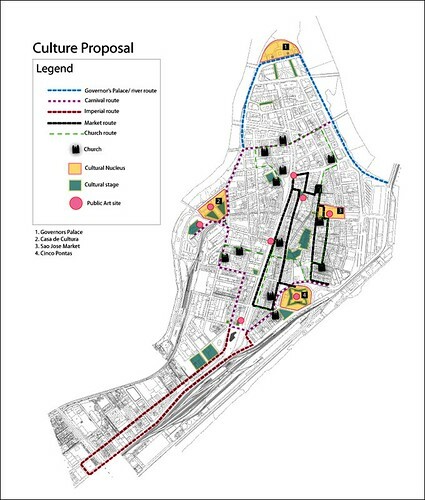 “The redevelopment plan calls for burial of utilities, business improvement loans, community policing strategies complimented by two small police stations, pedestrian cultural tours, establishment of a small business incubator, galleries to show and sell work of local artists, ‘major’ reconfiguration of traffic along the waterfront, streetscape improvements, composting and recycling programs, streets trees, green roofs, and entrepreneurship training among other things. 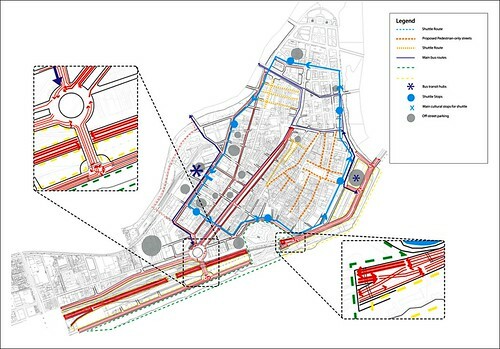 You can see some of the spatial planning for land use, transportation, and cultural activities in images of maps prepared by the student team, shown above. 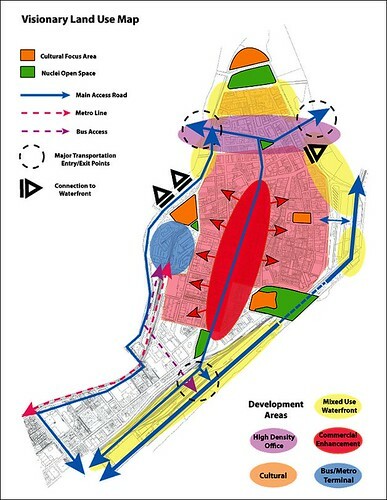 Both UrbanCincy and the project’s home site report that the city is close to adopting the UC plans. Randy writes that Michael Romanos and Carla Chifos, both on the UC planning faculty, have led groups of students in international study and planning work in the past in other parts of the world, too – including Thirasia, Greece where a team of students worked to develop a plan for the small, largely uninhabited Greek island that is experiencing increased tourism. All this strikes me as highly motivating, to say the least. There’s lots more information on the project, including a downloadable full report and presentation, on the project’s web site.